NB: the data presented below is a compilation of patient outcomes from Cell Innovations in-house studies following StroMed treatment. 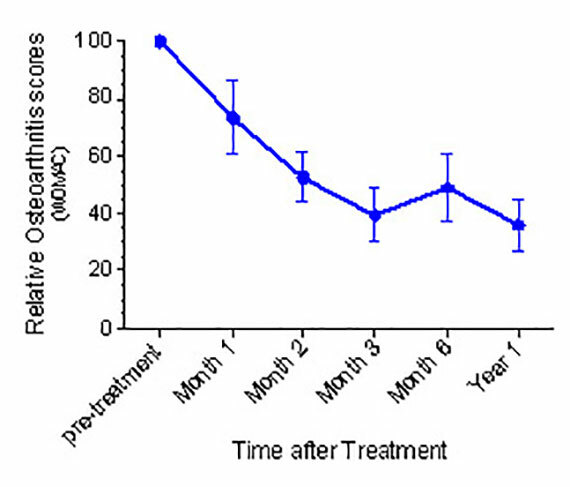 In 80 knee osteoarthritis patients at 1 year post-StroMed treatment there is an average improvement of 78%. No two patients are alike and patients will vary in their response to StroMed. MRI coronal images of the knee. The black area underneath the top knee bone indicates cartilage depth. By week 16 and sizeable increase in the regenerated tissue is observed. MRI coronal images of the knee. The black area underneath the top knee bone indicates cartilage depth. 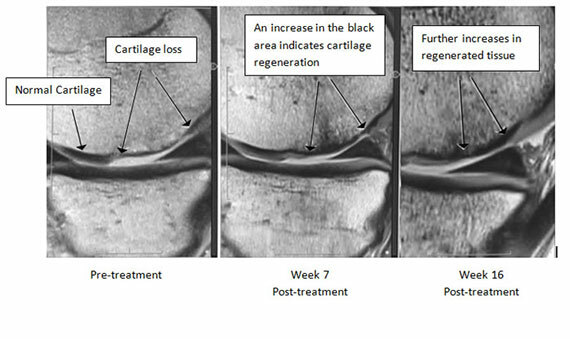 By week 16, a sizeable increase in the regenerated tissue is observed. MRI sagittal images of the knee. The black area underneath the top knee bone indicates cartilage depth. 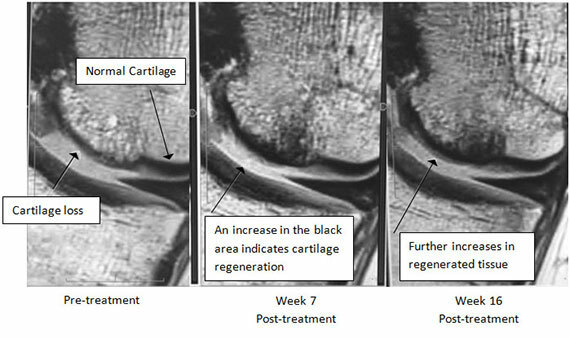 By week 16, a sizeable increase in the regenerated tissue is observed. The reduction in pain that occurs over time following StroMed treatment may also lead to Doctors recommending patients to reduce or stop their anti-inflammatory or pain medication. Note: Any case reports or patient results presented on this web-site are not indicative of all patient results. Like any medical procedure, all regenerative procedures have a success and failure rate. Similarly, all medical procedures have known adverse and unknown adverse affects. Please consult your doctor to discuss this. 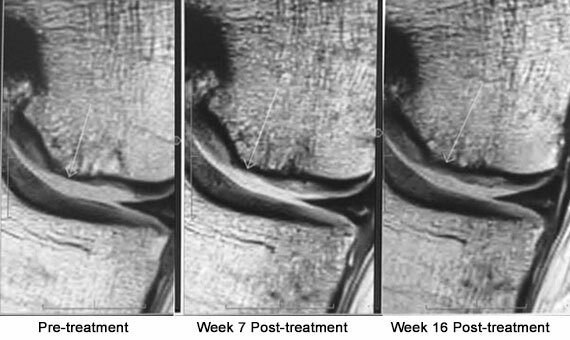 Patients who have Cell Innovations StroMed for osteoarthritis of the hips have demonstrated a 65% improvement on average in their osteoarthritis scores. NB: the data presented below is a compilation of patient outcomes from in-house studies following StroMed treatment. 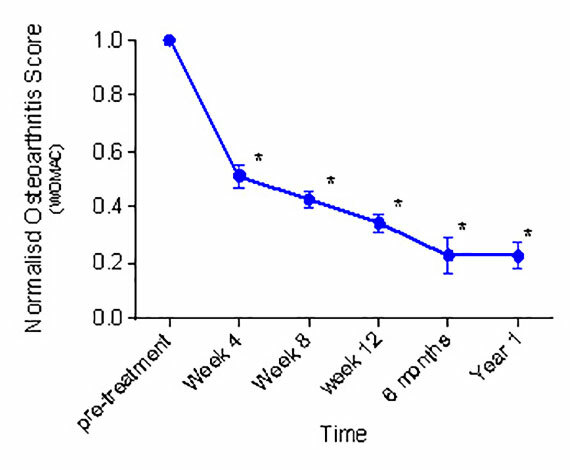 In 20 hip osteoarthritis patients at 1 year post-StroMed treatment there is an average improvement of 65%. Moseley, T.A.., M. Zhu, and M.H. Hedrick. Adipose-derived stem and progenitor cells as fillers in plastic and reconstructive surgery. Plast Reconstr Surg, 2006. 118(3 Suppl): p. 121S-128S. Rodriguez, J..P., et al., Autologous stromal vascular fraction on therapy for rheumatoid arthritis rationale and clinical safety. Int Arch Med, 2012. 5: p. 5. MacFarlane, R.J., et al., An -inflammatory role and immunomodulation of mesenchymal stem cells in systemic joint diseases: potential for treatment. Expert Opin Ther Targets, 2013. 17(3): p. 243-54. Zuk, P.A., The adipose-derived stem cell: looking back and looking ahead. Mol Biol Cell, 2010. 21(11): p. 1783-7. Chen, H.T., et al., Proliferation and differentiation potential of human adipose-derived mesenchymal stem cells isolated from elderly patients with osteoporotic fractures. J Cell Mol Med,2012.16(3): p.582-93. Stem cells have the remarkable potential to develop into many different cell types in the body during early life and growth. In addition, in many tissues they serve as a sort of internal repair system, dividing essentially without limit to replenish other cells as long as the person or animal is still alive. When a stem cell divides, each new cell has the potential either to remain a stem cell or become another type of cell with a more specialized function, such as a muscle cell, a red blood cell, or a brain cell . Stem cells are distinguished from other cell types by two important characteristics. First, they are unspecialized cells capable of renewing themselves through cell division, sometimes after long periods of inactivity. Second, under certain physiologic or experimental conditions, they can be induced to become tissue or organ-specific cells with special functions. In some organs, such as the gut and bone marrow, stem cells regularly divide to repair and replace worn out or damaged tissues. In other organs, however, such as the pancreas and the heart, stem cells only divide under special conditions. Perhaps the most important potential application of human stem cells is in the development of cell-based therapies to treat or cure disease and aid in the repair of tissues damaged by disease or injury. Stem cells, directed to differentiate into specific cell types, offer the possibility of a renewable source of replacement cells and tissues to treat multiple conditions, including osteoarthritis, back injury, stroke, heart disease, burns, autoimmune disease, and neurological disorders. Adult stem cells can also be cultured (that is grown in the laboratory) or non-cultured. VivaTech’s process uses non-cultured stem cells. The stem cells are separated from the adipose tissue on the same day and used immediately. The cells are not manipulated or grown in a laboratory. The cells which are obtained from adipose tissue after separation are called (StroMed) and contain the stem cells including other important cell types. VivaTech’s StroMed is obtained from the adipose tissue by the process of ultrasonic cavitation which does not expose the cells to any chemical reagents. 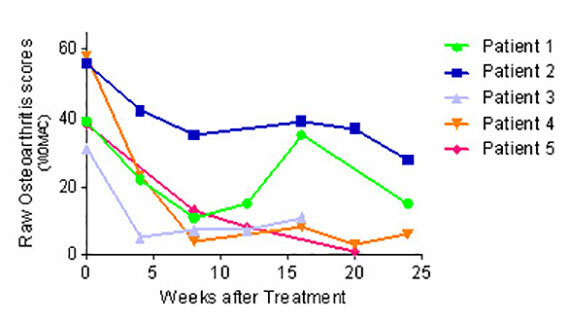 It has been well reported that the other cell types in addition to the stem cells in VivaTech’s sonication protocol are just as important for its multiple potent effects rather than using a single cultured stem cell type. For example the endothelial progenitor cell types present have been shown to aid in building new blood vessels to help supply blood to the damaged areas and support the growth of stem cells . The immune cells present possess potent anti-inflammatory functions . By utiliZing the patient’s own cells you will be able to conduct a safe and effective treatment with minimal chance of cell rejection. This technique uses the body’s own healing chemicals and growth material which we inject into the problem area to encourage cell rejuvenation and repair. This in turn helps to alleviate symptoms and manage pain. Using adipose tissue has many benefits over bone marrow as a source of mesenchymal. Stem Cell therapy is generating a lot of interest among the medical community and the general public. There are currently over 27 million Americans suffering from osteoarthritis. At VivaTech USA, we believe that the demand for this therapy will only increase with time and availability. Adipose tissue is removed by employing a minimally invasive liposuction technique. This is a less invasive alternative to traditional stem cell extraction techniques from bone marrow and provides a very high yield of stem cells. Based on positive outcomes from Cell Innovations in Australia, VivaTech is initially focused on the treatment of hip, shoulder and knee osteoarthritis. Clinical trials and pilot studies into the efficacy of adipose-StroMed for other diseases are ongoing. Our ultrasonic cavitation method offers a range of benefits over traditional techniques.